Veuillez trouver ci-dessous 'Tis The Season (Deck The Halls) (arr. Michael John Trotta) partition par Christmas Carol. 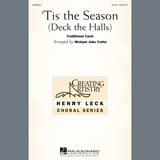 Nous avons 1 arrangement pour 'Tis The Season (Deck The Halls) (arr. Michael John Trotta) Voix Partitions.